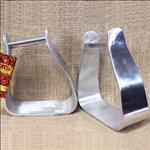 We do carry a huge collection of pre-built treeless saddles that are always in stock and ready to be shipped on order. However, we do understand that there may be a need for a variety of other options that the rider would like to have, be it for show, sports or otherwise. 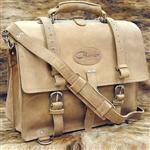 Below are some of the options that Hilason can provide as part of your custom order. However, these are not limitations and we also provide flexibility to the point where customers can share their thoughts and ideas with us that we can realize in their orders. Two limitations we do have in custom orders are the fact that we ask for atleast 30 working days to get the work completed in addition to the extra $98 we charge for customization and non-sceduled production. Minor modifications are included in custom charges. However, the final charge is determined after the choices have been made by the customer. 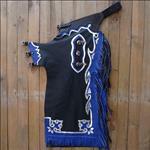 You have the option to choose between having a rawhide braided horn or a leather wrapped horn. The other choice available is the length of the horn which could be 2.5in, 3in., 3.5in., 4in. or a custom chosen size. Other than the seat size, you do have the option to choose from one of the seat colors above. Do keep in mind that the ostritch prints are leather too and so there might be a slight variation in shade depending on how the dye reacts to the leather at the time of production. If you do have any other color besides the ones above, you may enquire on the possibility of getting that too in your custom saddle. 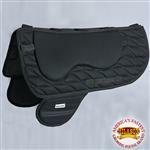 Western treeless saddles come in either square skirt or round skirt. 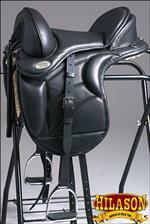 You do have the option to choose from any of the shapes and deisgns above to match the rest of your saddle. 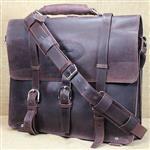 You may also combine two designs to come up with your version but only on approval. Cheyenne Rolls are an important cosmetic addition to your saddle and it is a component of great interest if you are picky on your design of saddle. You may get any of the above for your custom order. 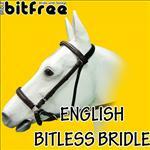 You may also combine two or more for your version of saddle if accepted at the time of order. If all the above options confuse you, a safer and easier route would be to pick any of the saddles below and have that modified to your taste. That modification can be anywhere from color change, seat type, skirt change all the way to structure modification. 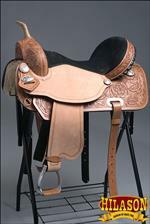 Get your dream saddle by calling us now at 1-888-HILASON.